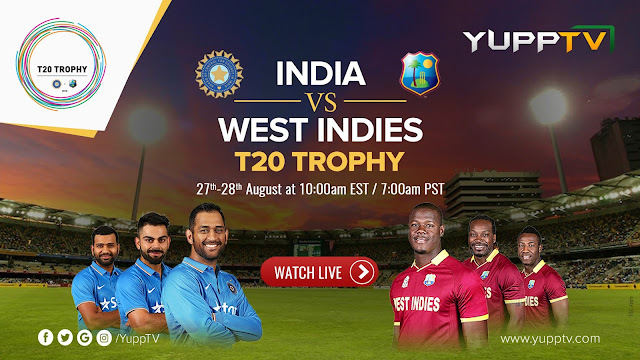 Atlanta, August 23, 2016: Delighting the tech-savvy cricket enthusiasts in USA, Canada and Caribbean islands, YuppTV, the largest OTT player for the South-Asian content has secured the exclusive broadcasting rights of the T20 matches to be held between Team India and the current T20 world champions, West Indies. The T20 series, taking place in Florida, USA on 27th and 28th August will be available LIVE on YuppTV through multiple internet enabled devices, including Smart TVs, Smart Blu-Ray players, laptops, gaming consoles, streaming media players, smartphones and tablets. Further commenting on the development, Uday Reddy, Founder & CEO, YuppTV said, “We started YuppTV with the vision of providing the most entertaining South-Asian content to the expat community, to be consumed by them at their convenience. Cricket, as a sport has a cult following amongst the viewers and we are glad to deliver top-notch entertainment to the sports enthusiasts on our platform. We further hope that our audience will enjoy the latest offering on YuppTV, catching the LIVE and exclusive Ind vs WI T20 Trophy match. This offering for the cricket enthusiasts isn’t the first for YuppTV. Previously, they had also successfully broadcasted the Asia Cup on their platform, held between Feb-March, 2016. YuppTV is one of the world’s largest internet-based TV and On-demand service providers for South Asian content, offering more than 200+ TV channels, 5000+ Movies and 100+ TV Shows in 13 languages. YuppTV has 25,000 hours of entertainment content catalogued in its library, while nearly 2,500 hours of new on-demand content is added to the YuppTV platform every day. YuppTV offers Live TV and Catch-Up TV technology. It has recently launched YuppFlix, a movie on demand streaming service for Expat Market and YuppTV Bazaar an online marketplace for the premium content curator. YuppTV is currently ranked #1 Internet Pay TV platform for Indians living abroad and also the largest Internet TV platform from premium content availability in India. YuppTV is the most downloaded Indian SmartTV app and it also boasts of 8 million mobile downloads with 4.0 user rating. Did You Watch This Versatile Comic Web Series “What’s up Velakkari” on YuppTV?